For years, MJM Innovations has prided itself on being the leader of providing cost savings transportation software and management solutions to the Senior market for AAA’s, Senior Centers, Congregate Meal Sites, Home Delivered Meals and Home Care Services with our flagship product SeniorStat. We have continued to innovate and improve SeniorStat’s ease of accessibility and benefits for its users with advances in the web portals, touch screen, tablet, smartphone and terminal options. While seniors are slowly growing adaptors of technology and social networking sites that may address a lack of meaningful social companionship and support, unfortunately these public platforms also open seniors up to risk as they are often targeted victims of identity theft and other fraudulent schemes. In addition, those seniors that do interact on social platforms may only do so with immediate family still isolating themselves from the community and local services as a whole. So How Can Our Technology Help? The answer is SeniorSocial. A groundbreaking solution that combines the strength of social networking with a senior-friendly user experience into one simple but powerful member engagement app. SeniorSocial makes it easy for seniors to now interact with their centers and their social support community- whenever and wherever with smartphones, tablets and on web portals enjoying the same features as the mobile app. …and combined with center services, like registering for meals and much more, allows the centers to offer, track and even expand services. SeniorSocial works as a standalone solution OR as an integrated module of SeniorStat providing the time and money saving ways to capture, track and report the center’s services data electronically. 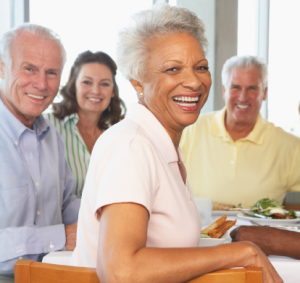 We’re excited to be able to address senior social isolation and bring this private social networking platform that makes it easy for seniors to stay connected with their centers services AND their community.